Goal: Determine the difference between red and black cards in the two piles. Solution: No matter how the deck is cut, the difference will always be 3. Goal: Rotate the board clockwise and counter-clockwise to get the red, yellow, and blue blocks to fall into their respective spaces. Solution: Rotate clockwise, counter-clockwise, then clockwise four times, then counter-clockwise, clockwise twice, counter-clockwise, clockwise another four times, counter-clockwise, clockwise twice more, counter-clockwise again, then clockwise another four times, counter-clockwise six times, clockwise, counter-clockwise twice, and finally, clockwise one last time. Goal: Slide each block into its space in 13 moves. Solution: The solution, step-by-step, is as follows. Pieces are labeled in the image to the right. As before, make each move completely without lifting the stylus so it counts as only one move. Slide the lower blue stone (piece E) to the right one space. Next, slide the C block (piece C) down two squares. Then, drag the upper blue block (piece F) left one space and up one space. Move the D block (piece D) two squares to the left. Slide E up one and right one. Slide the A block (piece A) up two squares. Next, drag C down one and right one. Move the B block (piece B) right two spaces. Drag D down one and left one. Now, slide F down two squares. Slide A up one square and left one. Then, drag E left two squares. Finally, move B up one square and right one. Goal: Combine the 3 keys into as many shapes as possible to determine which of the keyholes (A-G) they can open. Solution: A, B, D, F, and G all work. Goal: Determine how long it would take to travel from Station A to Station D.
Solution: It’s natural to assume that the stations would be in the same order as the letters of the alphabet, but they’re actually not. Once you realize that station C is between A and B, the solution becomes clearer. 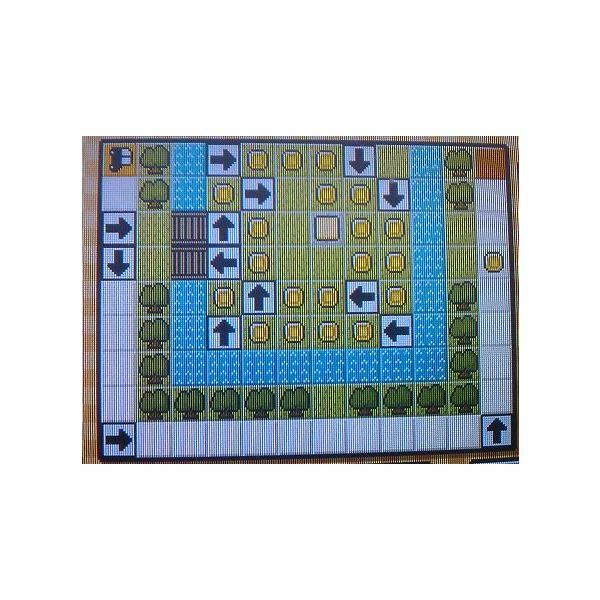 It takes 20 minutes to travel from A to D.
Goal: Get Luke and Layton to the exit of a more complex slide puzzle. Solution: Here’s the solution. Pieces are labeled in the image to the right again. First, slide the yellow block (piece D) up one square and two squares to the right. Next, slide Luke and Layton (piece F) two squares to the left. Then, drag the red block (piece E) down one. Now move D down one. Move the blue block (piece B) down one square, left two squares, and down one more. Now Slide E up one space. Then, drag F right three spaces. Next, move B down two and right one. Then, slide D left two squares and down one. Now, move the green block (piece A) right one space and down two. Drag the orange piece (piece C) left two squares and up two squares, into the exit. Move A up two and left one. Then, drag E up two squares and right one square. Drag F right one space and up two. Move B right one space. Move D down one space. Now, slide E right one space. Slide F left one space and up two spaces. Drag E right three spaces and down one. Now move F down one square, left two squares, down one more square, and finally, left one more square. Then, drag A right two spaces, down two spaces, and right one more space. Slide C down two spaces and right two spaces. Finally, slide E right one square, up two squares, right one more square, and up two final squares to the exit. Goal: Determine the largest number of sections you can cut the circle into using five straight ropes. Solution: The sections don’t have to be the same size, which makes a star shape the easiest way to cut it into the 16 sections, the largest number of sections possible. The solution is 16. Goal: Make a white top hat in the same spot as the black top hat, using the same blocks. Solution: Notice that when you move the blocks, the space underneath them is white. Rotate the black blocks to frame the outside of the grid where they start in, and the empty space contained inside will form your white top hat. Goal: Stack the cans so each stack is all the same product again, in 14 moves. Move the top can from the fourth stack to the first stack. Next, move the top can from the second stack to the fourth. Now, move the top two cans from the third stack to the second. Lift the top can from the third stack to the first. Now lift the top four cans from the first stack to the third stack. Then, move the top three cans from the second stack to the first stack. Then, lift the top can from the second stack to the third stack. Lift the remaining can in the second stack to the first stack. Move the top four cans from the third stack to the second. Then, move the top two cans from the fourth stack to the third. Now, lift the top can from the fourth stack to the third. Carry the top five cans from the first stack to the fourth. Move the top two cans from the fourth stack back to the first. Finally, lift the top can from the third stack to the first. Goal: Create a valid equation by placing number tiles in the boxes. Solution: The equation should read 18:49 X 3 = 56:27. Goal: Using the calendar shown, determine what the lowest date out of four dates circled in a square that add up to 88 would be. Solution: The four days of the month to add up to 88 would have to be 18, 19, 25, and 26. This makes 18 the solution. Goal: Re-arrange the slide puzzle to form the three bracelets into one big necklace. Solution: The solution is as follows, step-by-step. Pieces are labeled in the image to the right. First, drag the top left empty space (piece A) to the left one square. Then, drag the tile next to that (piece B) one to the left. Now, move the tile next to that (piece C) one to the left as well. Move the piece underneath that (piece G) one space up. Now, drag the piece beside that (piece F) one to the right. Then, drag the piece beside that (piece E) one to the right as well. Next, move the piece beside that (piece D) one to the right. Now slide A down one square. Slide B left one space. Then slide C left one space as well. Move E up one square. Drag F left one square. Drag G down one square. Now slide E right one square. Then slide C one square to the right. Now slide B one square to the right as well. Then, slide A up one square. Now, slide D one square to the left. Next, slide F one square to the left. Now move the tile underneath that (piece J) up one square. Drag the piece underneath that (piece N) up one square as well. Slide the piece on the left of that (piece M) one to the right. Slide the piece on the left of that (piece L) one square right as well. Now, move the piece above that (piece H) down one space. Now slide F one square to the left. Slide J one square left. Slide G one square left as well. Drag the piece underneath that (piece K) up one square. Now, move the piece underneath that (piece O) up one as well. Slide M one square right. Then, slide L one square right. Now, slide H one square right as well. Drag D one square down. Slide F one square down as well. Now move the piece underneath that (piece I) up one. Now move N left one square. Next, drag L up one square. Slide H right one space. Now drag N down one square. Next, move I down one square. Drag G left one square. Now, move L up one square. Then, slide H up one square as well. Finally, slide M one square to the left to complete the puzzle. Goal: Change the tiles so that the four types of fruit are lined up. First, rotate the bottom right square 180 degrees and swap it with the top right square. Now, rotate the new bottom right square 90 degrees clockwise and swap it with the top left square. Rotate the new bottom right square 90 degrees clockwise and swap it with the middle right square. Next, rotate the new bottom right square 90 degrees counter-clockwise and swap it with the middle left square. Then, switch the new bottom right square with the bottom left square. Switch the new bottom right square with the top middle square. Rotate the bottom right square 180 degrees, and switch it with the bottom middle square. Finally, rotate the new bottom right square 90 degrees counter-clockwise. The puzzle will now be solved. 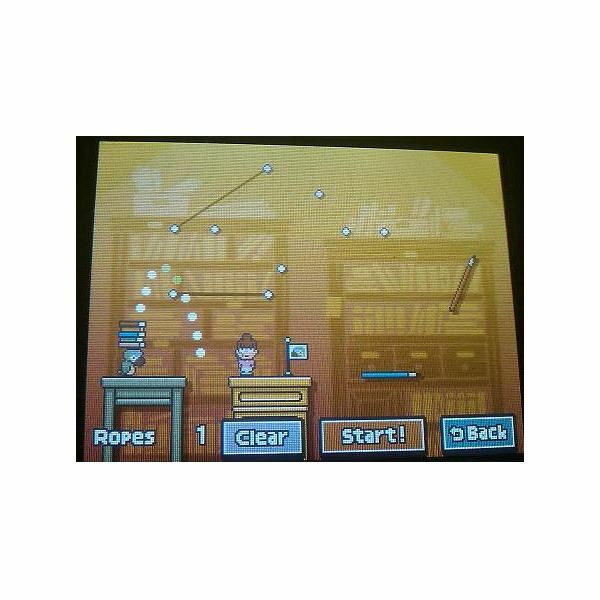 Goal: Guide Luke and Layton to the exit one final time. Solution: Here’s the solution step-by-step again, with the pieces labeled to the right as always. First, slide the green block on the bottom left (piece D) down one square. Now, slide the blue piece next to that (piece E) left one square. 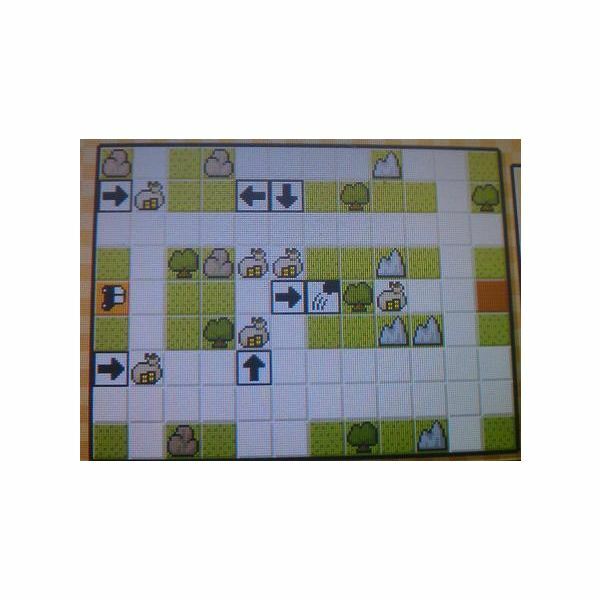 Then, drag Luke and Layton (piece H) right one square. Now, move the yellow block above them (piece F) down one square and left one square. Slide the dark purple piece at the top center (piece B) down one square and right two squares. Drag F up two squares. Slide H left one square. Now, move the light purple piece in the bottom right (piece G) down one square. Now, move B down one square and left two squares. Then, slide G up two squares. After that, drag H two squares to the right. Slide B down two squares and left one square. Now, slide F down two squares and right one square. Slide E right one space and down one space. Now, slide the orange block in the top left (piece A) right one space and down two spaces. Now, drag the light blue piece in the top right (piece C) left two squares and up two squares into the exit. Slide A up two spaces and right two spaces. Now, move E up three squares and left one square. Then, move F left one square, up one square, and left two squares. Then, drag G two squares to the left and two squares down. Now, move A left one space, down three spaces, and right one space. Slide F two squares right and two squares up. Move D up two spaces. Then, move A left two spaces. Drag H up two spaces. Now, slide G right two spaces. Then, drag B right two spaces. Next, slide A down one square, left one square, and down one square. Slide H left two spaces, down one space, and left one space. Now, drag F down one space, right one space, down one space, and right one more space. Slide C down two squares and right two squares. Finally, slide H right one square and up 5 squares into the exit. Goal: Assemble the blocks into the shape of a square with the red orb in the center, in the same position it began in. 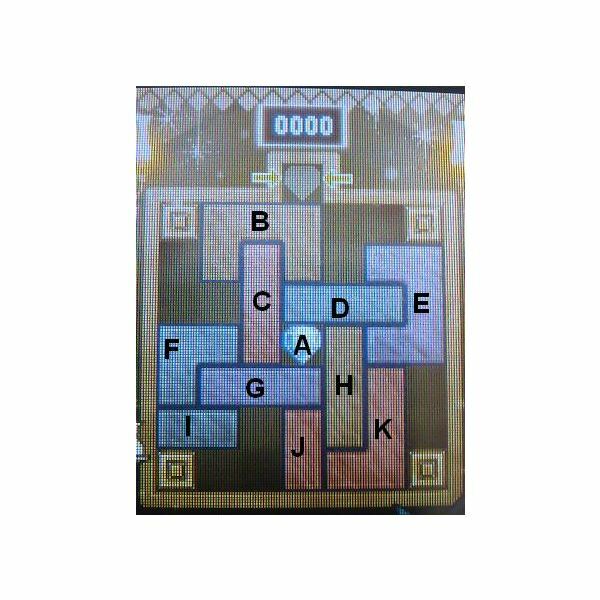 Solution: Another slide puzzle means another step-by-step solution with a labeled image to the right. First, slide the L-shaped block at the very top (piece B) one space left. Slide the orb (piece A) left one space, up two spaces, and left two more spaces. Slide the L-shaped block just below the very top center (piece D) left one space and down one space. Now drag B one square to the right. Move the Z-shaped block the left (piece C) up one square, right one square, and up one final square. Move D two squares to the left. Next, drag the T-shaped block on the bottom (piece F) up three spaces. Move the upper L-shaped block in the bottom right (piece G) left one square, down one square, left one square, and down one more square. Slide F down one square, right two squares, and up one square. Slide D two squares to the right. Now, move the L-shaped block on the bottom left (piece E) up one space, left one space, and up one more space. Then, slide D down one square and left two squares. Move G up three spaces. Now, drag the last L-shaped block in the bottom right (piece H) left three squares and down one square. Move F down two spaces, left one space, and down one space. Now move G down one space. Then, slide B down one square, right one square, down one square, and right one more square. Next, drag G up three spaces. Slide F up two squares and left one square. Move H right one square, up one square, and right two squares. Drag F down one square and right one square. Drag D right one square and down one square. Move G down one square and right one square. Slide C right one square. Now, slide A right one square. Now, drag E up one space. Then, move C down two spaces and left one space. Move G left one square, up one square, and left one square. Then, move C right one space, up one space, and right one more space. Then, drag E down two spaces and right one space. Now, move A down one square, right one square, and down one square. After that, move G down one square and left two squares. Slide C up one space. Then, drag A right one space. Now, move C left one space and then down one space. Now, move G right one space. Then, slide B left one square and up one square. Drag F one square up. Finally, slide H one square to the left to complete the square. 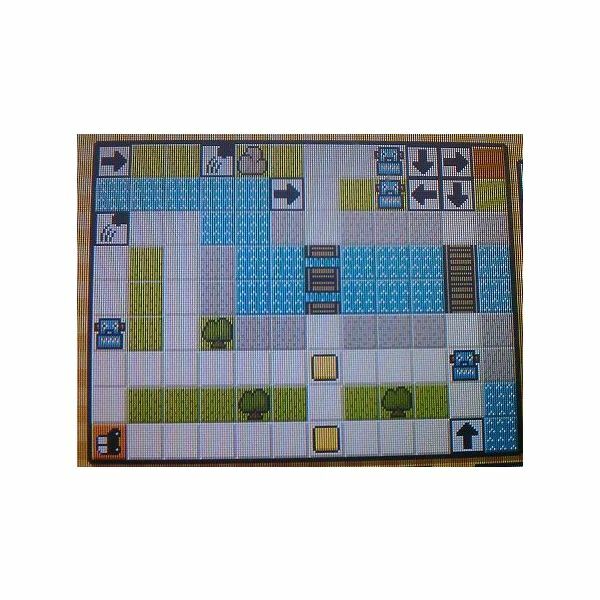 The Toy Car minigames are solved by reaching the exits of the courses with the toy car while picking up all of the objects along the way. There are 10 courses to complete in total, and new ones are unlocked by completing puzzles for people. The solutions to each will be provided here as an image of the correct arrangement of arrows. This course is given to you by Margaret at the Hotel. Goal: Reach the exit and collect all the flags. Tiles: 2 →, 2 ←, 2 ↑, and 1 ↓. Solution: Using just 5 of the 7 pieces provided, you can see the correct arrangement in the image to the left. This course is given to you by Bostro outside the Casino. 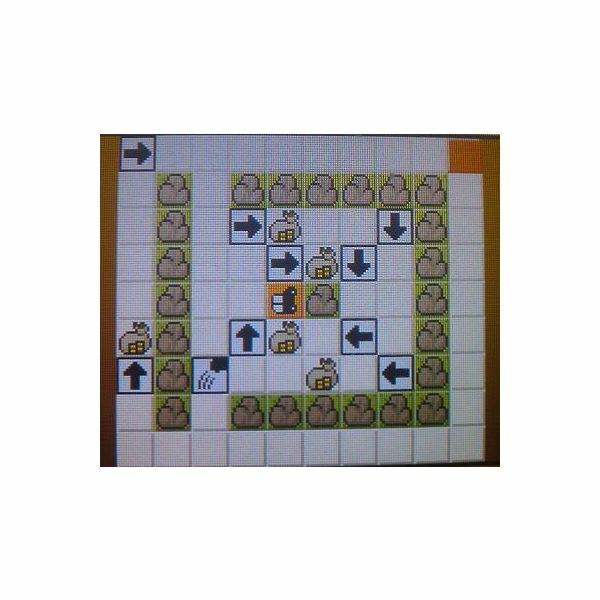 Goal: Reach the exit and collect all of the money bags on the way. Tiles: 3 →, 2 ←, 2 ↑, 2 ↓, and 1 jump tile. 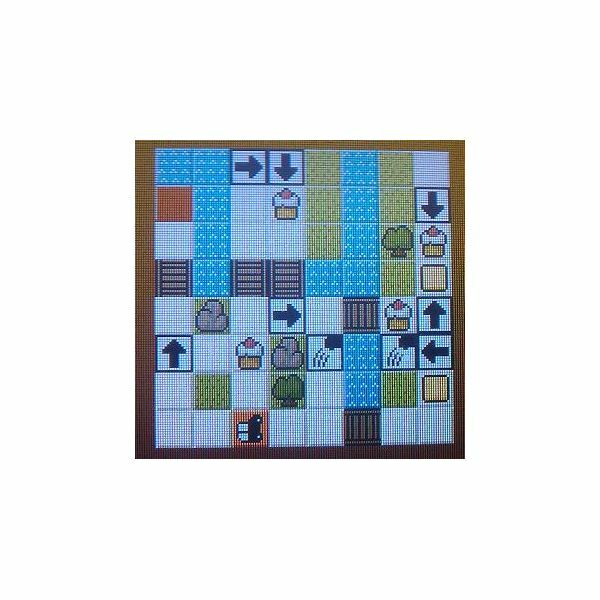 Solution: Using all of the tiles provided, the arrangement that will complete the course is shown in the image to the left. This course is given to you by Belle on Flatstone Street. 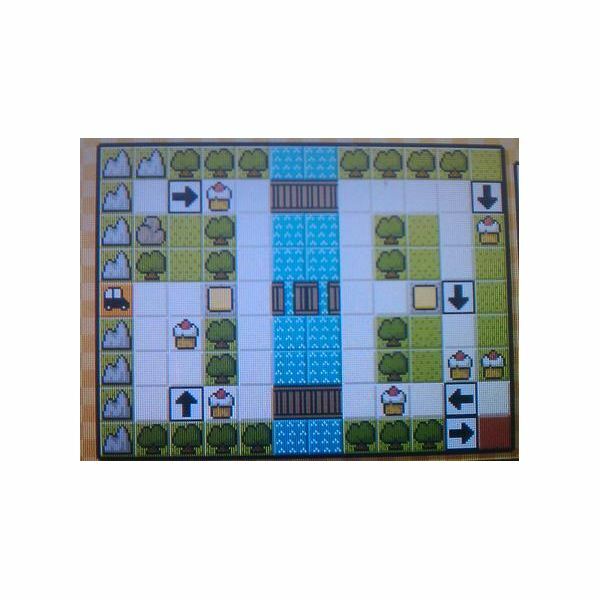 Goal: Reach the exit of the course and pick up all the cakes along the way. Tiles: 2 →, 2 ←, 2 ↑, 2 ↓, and 2 jump tiles. Solution: You’ll need to use 9 of the 10 tiles provided to complete this course. The solution can be seen to the left. This course is given to you by Pavel outside Chinatown. 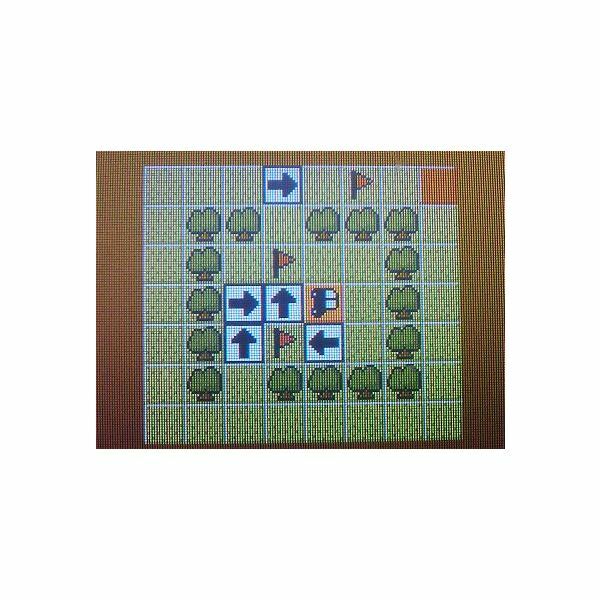 Goal: Reach the exit of the course and collect all the flags along the way. Tiles: 3 →, 2 ←, 2 ↑, 1 ↓, and 2 jump tiles. 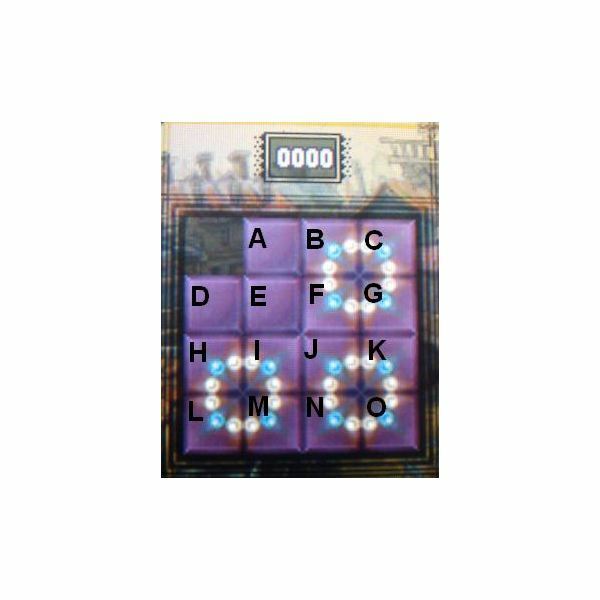 Solution: This course can be cleared using only 8 of the 10 tiles provided. See how to solve it in the image on the left. This course is given to you by Becky at the Hotel. Goal: Reach the exit and collect all of Max’s toys along the way. 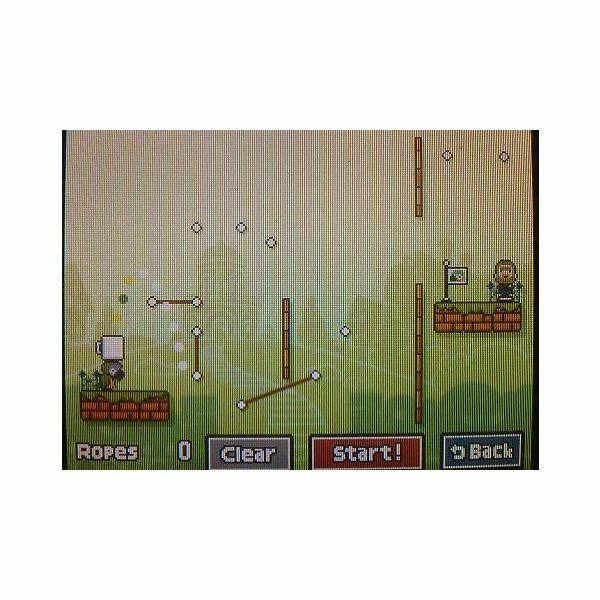 Tiles: 3 →, 1 ←, 1 ↑, 2 ↓, and 2 jump tiles. Solution: This course requires every single tile provided to clear. View the image on the left to see how to arrange them. This course is given to you by Barton at Pepper’s Noodle House. Goal: Reach the exit and clear all the cakes along the way. Tiles: 2 →, 1 ←, 1 ↑, and 2 ↓. 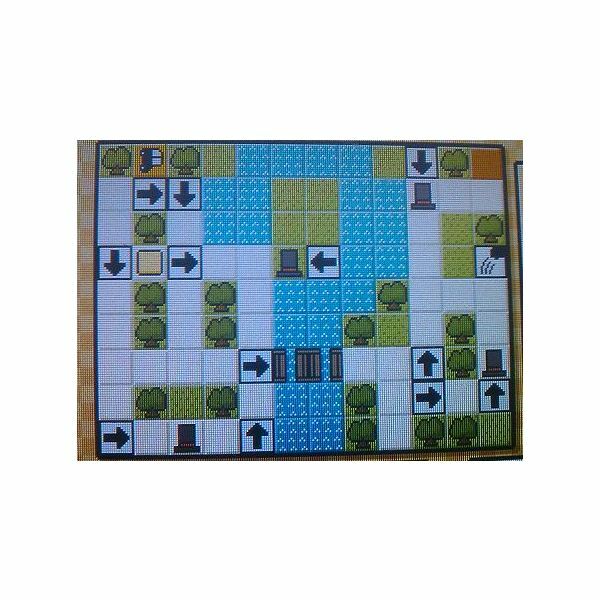 Solution: You have to place every tile provided on the course to solve this one. Look at the image to the left to see how. This course is given to you by Checker at the toy store. Tiles: 4 →, 3 ←, 4 ↑, 3 ↓, and one jump tile. Solution: You need to use every tile given except the one jump tile to complete this. Look to the left to see where to put your arrows. This course is given to you by Subject 3 outside the Thames Arms. Goal: Reach the exit and dig up every carrot along the way. Tiles: 3 →, 3 ←, 3 ↑, 3 ↓, and 3 jump tiles. Solution: This course gives you 15 tiles and can be completed using just 10. View the image to the left to see how to solve it. This course is given to you by Mark at the Casino. Goal: Reach the exit and pick up all the money bags on the way. Tiles: 3 →, 1 ←, 2 ↑, 2 ↓, and 1 jump tile. 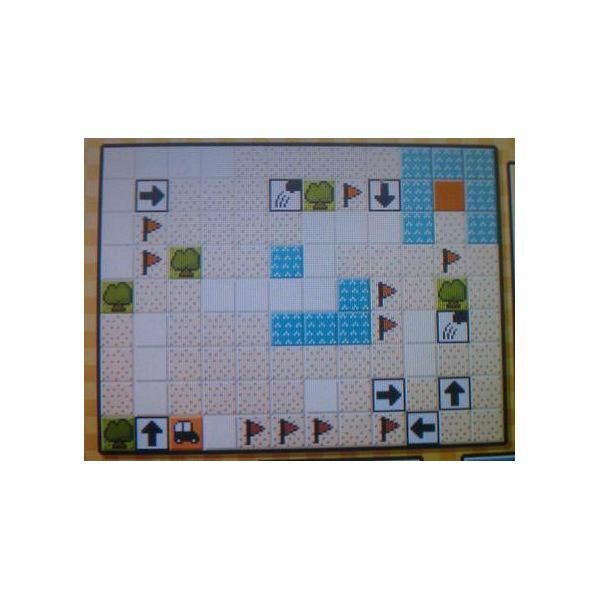 Solution: As shown in the image to the left of this, you can complete this course using only 7 of the 9 tiles provided to you. 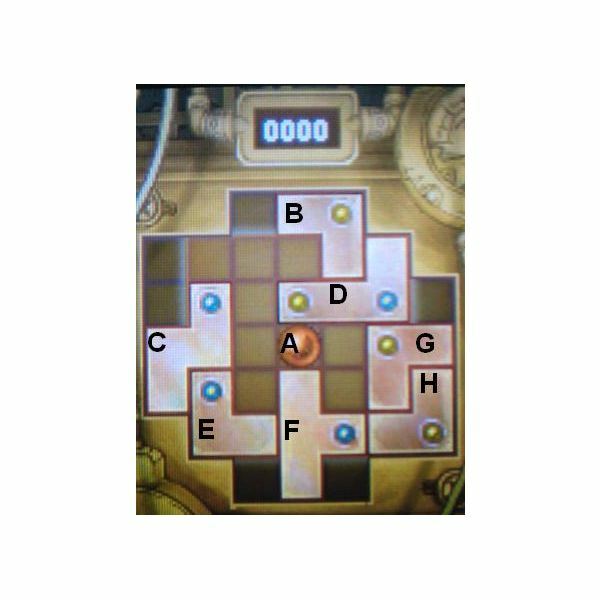 This course is given to you by Professor Layton for completing the other nine courses. Goal: Reach the exit and pick up all of the Professor’s top hats on the way. Tiles: 5 →, 1 ←, 3 ↑, 3 ↓, and 2 jump tiles. Solution: This course will take 13 of the 14 tiles provided to solve. See how on the left. 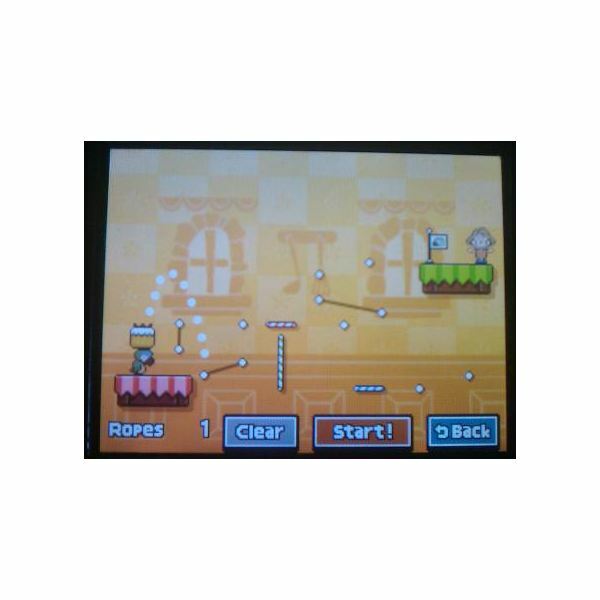 The Parrot minigames are solved by drawing ropes to help the parrot complete delivery requests for various characters. There are 12 delivery requests in total, and new ones are unlocked by completing puzzles for people. 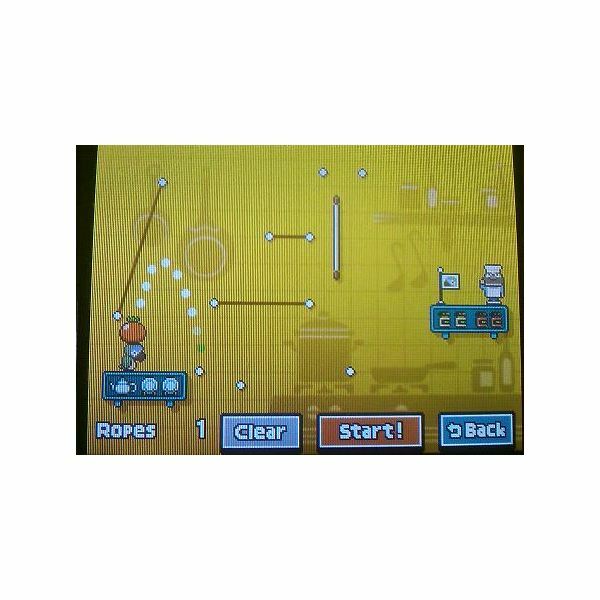 The solutions will be provided as an image of each correct layout of ropes. Goal: Deliver the Toadstool to Stachen. Time Limit: 10 seconds or less. Solution: Using all three ropes, this will only take 6 seconds to complete. 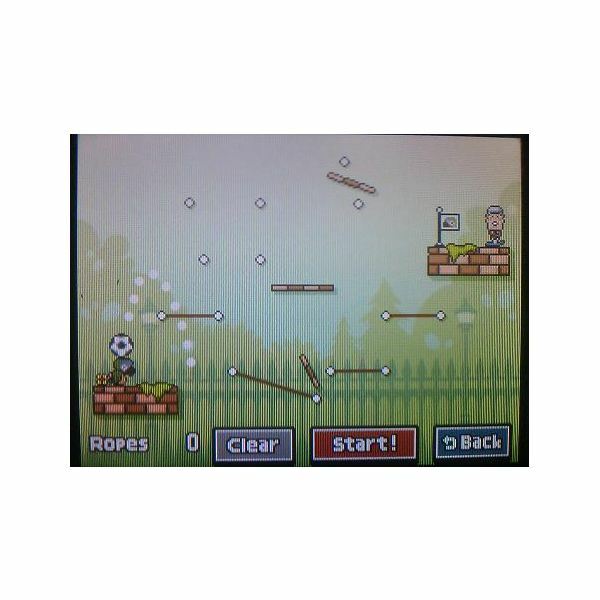 The solution is shown in the image to the left. Goal: Deliver the flower to Adeline. Time Limit: 15 seconds or less. Solution: Using all three ropes, this will take 11 seconds to complete. The image to the left shows the solution. Goal: Deliver the cake for Minnie. 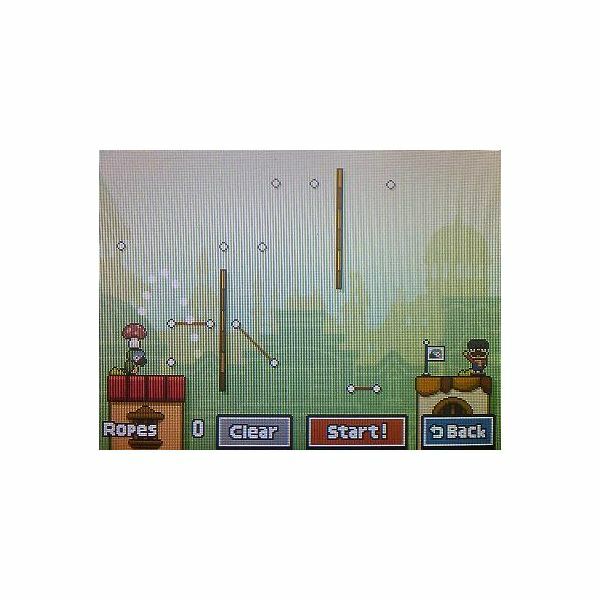 Solution: Using only three of the ropes, this course will be complete in just 5 seconds. See the image to the left for the answer. Goal: Get a tomato for Paillard. Solution: Using just three ropes, this delivery will be complete in 8 seconds. 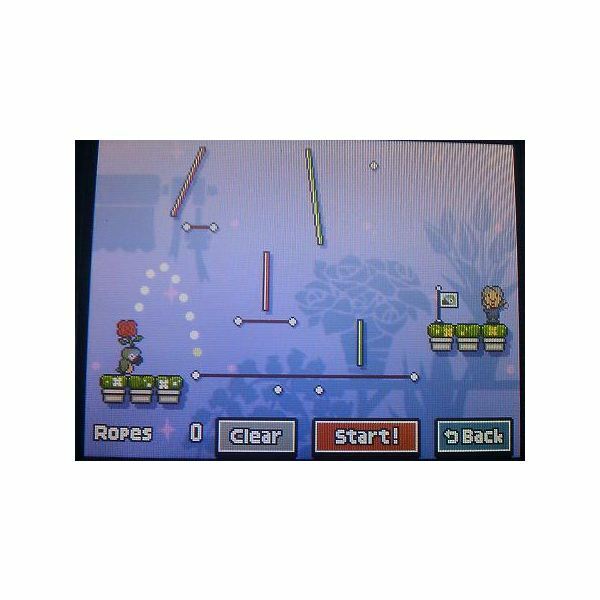 The correct arrangement of the ropes is shown on the left. Goal: Bring Silky his coffee. Solution: Using all three of the ropes, this delivery will be complete in just 5 seconds. The answer is shown to the left. Goal: Find a friend for Viv. Solution: Using all five ropes provided, it will take 14 seconds to complete this delivery. See the image on the left for the way to complete this. Goal: Help Maya carry the heavy books. Solution: Using only two ropes, this delivery will take 9 seconds to complete. 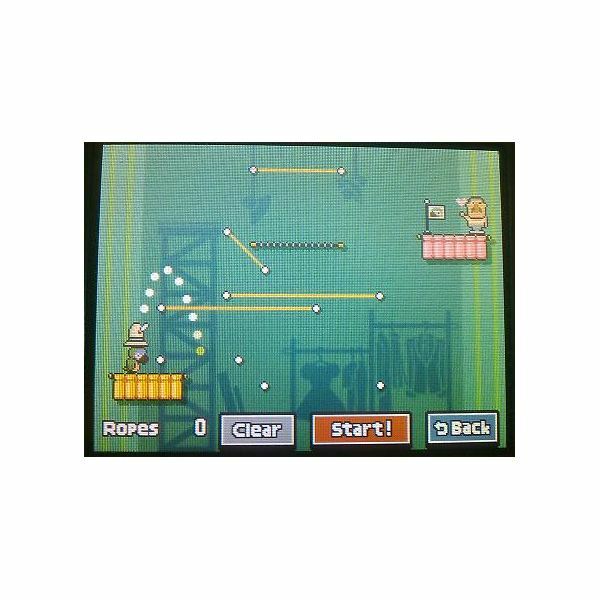 See how to arrange the ropes on the left. Goal: Get Paige’s homework for her. Time Limit: 7 seconds or less. Solution: Using three ropes, this delivery will be complete in 6 seconds. The image on the left shows the arrangement of ropes needed. Goal: Bring Beacon his hat. Time Limit: 18 seconds or less. Solution: Using four ropes, this delivery will take 15 seconds to complete. The solution to this errand is in the image to the left. Goal: Get Raleigh’s soccer ball back for him. 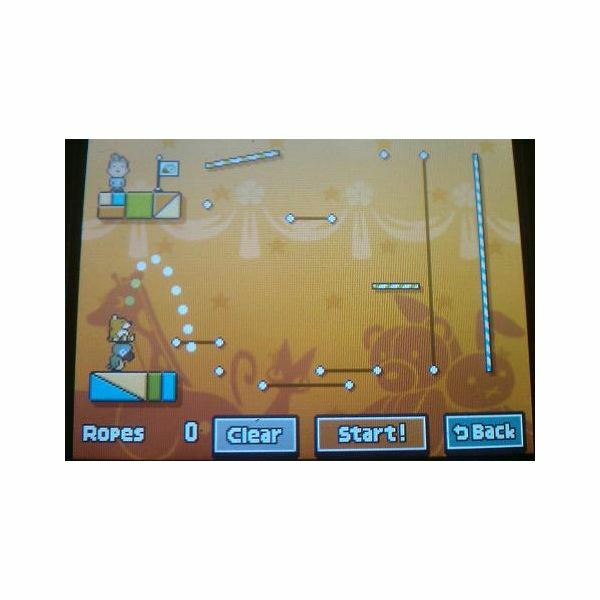 Solution: Using all four of the ropes provided, it will take 7 seconds for the parrot to complete this delivery. The solution is on the left. Goal: Delivery Hardy’s lunch to him. Solution: Using all five of the ropes, this delivery is complete in 6 seconds. The image on the left will show you how to do it. Goal: Find a gift for Hazel to give. 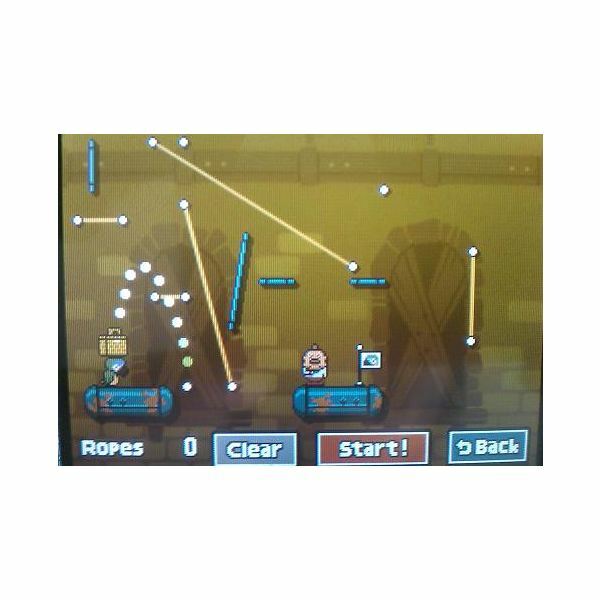 Solution: The last delivery will take five ropes and 8 seconds, as shown to the left. Page 1: On the first page, from left to right, place the Hat, Boot, and Dead Tree stickers. Page 2: On the second page, place the Plum Tree sticker in the center and the Man sticker to the right of it. Page 3 carries over some stickers from previous pages, but nothing new needs to be placed on it. Page 4: Place the Plum sticker in the speech bubble on the fourth page. The Man and Plum Tree should already be here from before. Page 5: The Girl sticker goes in the center of the fifth page. The Boot sticker should be carried over from before. Page 7: There’s nothing new on page 6, so place the Banana sticker on the table in page 7. Nothing new needs to be placed on Page 8. The book is complete. Page 1: Place the Woman sticker on the first page. Page 2: Place the Raincoat sticker on the second page. Page 3: Place the Man sticker on Page 3, and the Coffee sticker in his speech bubble. Page 4: On the fourth page, add the Boy sticker and the Tea sticker in his speech bubble. Page 5: On the fifth page, stick the Milk sticker in the right-hand speech bubble. Page 6: Add the Traveler sticker to the sixth page. Page 7: Place the Cocoa sticker in the speech bubble, and the Mushroom sticker on the counter. There will be nothing new to place on the remaining pages. The book is now complete. Page 1: On the first page, stick the Butler sticker. Page 2: Stick the Young Master sticker on the left, and the Master sticker on the right of the second page. Page 3: Add the Chef sticker to the third page. Page 4: On the fourth page, add the Cat sticker. Page 5: Put the Gardener sticker on the fifth page, and the Watch sticker in his speech bubble. The sixth page will not need any new stickers added. Page 7: Add the Tutor sticker to the seventh page, and put the Trowel sticker in his speech bubble. Page 8: Put the Maid sticker in the doorway of the eighth page. Page 10: There was nothing new on the 9th page, so place the Fork sticker on the tenth page. Page 11: Place the Figurine sticker in the speech bubble on Page eleven. The remaining pages will not need any new stickers. The book is now complete. Goal: Using Future Luke’s clues, tap the card in the line that’s a spade. Solution: The spade is the card on the far right. Tap that to continue. 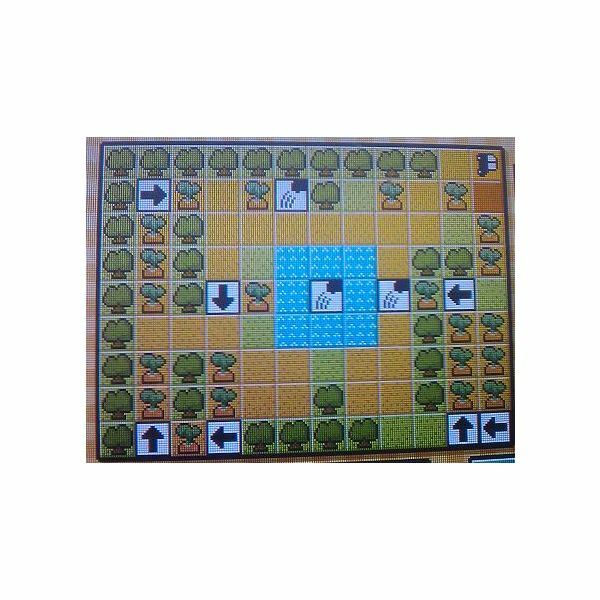 Goal: Arrange the troops on Professor Layton’s side so that they won’t lose to Dimitri’s side. Solution: The key here is that it only says you have to not lose. It doesn’t say anything about winning. If you arrange your troops, from the top down, in the order 1, 1, 4, 3, 1, you’ll win two of the one-on-one battles, lose two, and the fifth will be a draw. Thus the overall score will be a draw. 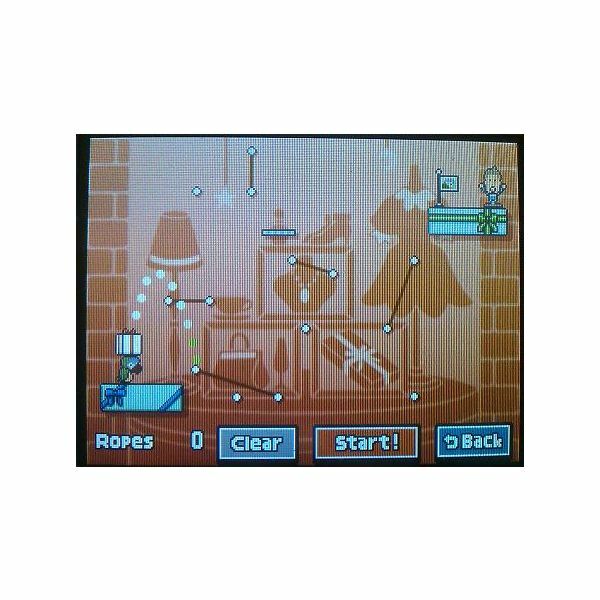 Goal: Find all of the sensors in the room so Professor Layton can escape. 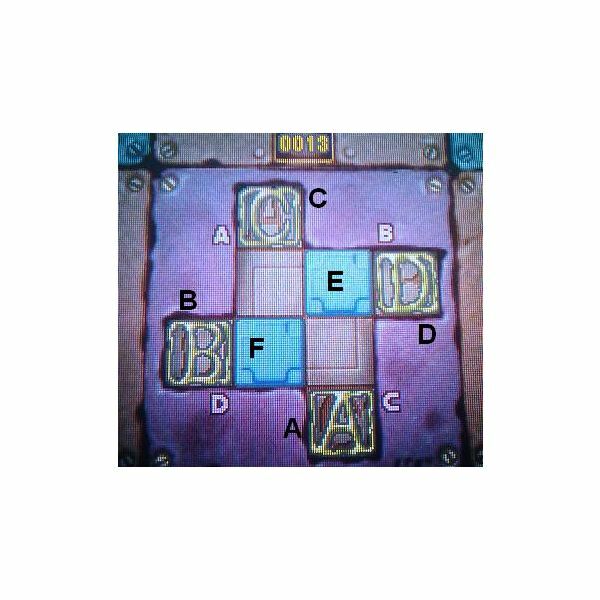 Solution: From left to right, each column of the grid should be marked as follows: In the first column, mark the top square, the center square, and the bottom square. In the second column, mark all squares. Leave the third column unmarked. Mark every square in the fourth column. Leave the fifth unmarked. In the sixth column, mark just the top square. Finally, mark every square in the sixth column. 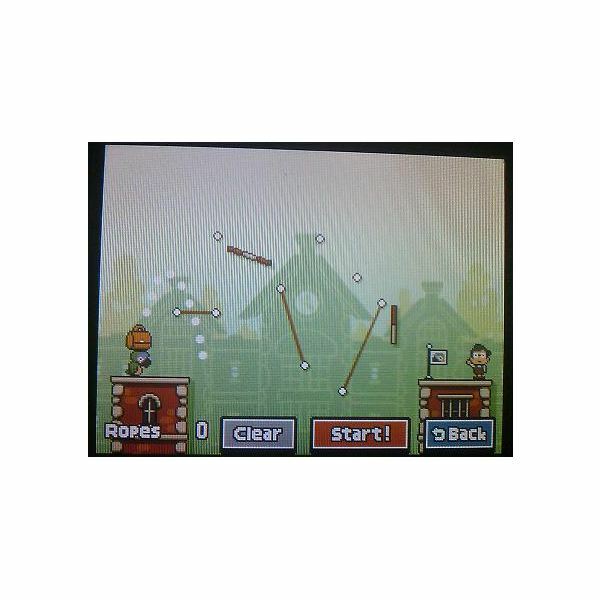 The Hidden Door can be accessed by entering a code obtained in the previous title in the series, Professor Layton And The Diabolical Box, to give a little extra to players that own both. This will provide you with one final puzzle to solve. Goal: Slide the gem into the exit. Slide the green L-shaped block the left (piece F) up one square. Slide the small green block underneath that (piece I) down one square and one square to the right. Then, slide the long purple piece next to that (piece G) left one space and down one space. Now drag the gem (piece A) down one space and three spaces to the left. Then, move the orange block on the left (piece C) down one space. Move the arch-shaped piece on top (piece B) one space to the right. Drag F up one space. Now move C left one space. Next, slide the long green piece next to that (piece D) one square to the left. Slide the small orange block at the very bottom (piece J) up two spaces and one space to the left. Now, drag the yellow block beside that (piece H) left one square. Move the orange L-shaped block on the bottom right (piece K) left one space as well. Slide the sideways purple arch-shaped block on the right (piece E) down two squares. Move B one space to the right. Then move D two spaces to the right. Drag J up three spaces. Move C to the right one square. Next, drag A one space right. Move F down two spaces. Then, slide J left one square, down one square, and left one square. Now slide C up two spaces and left one space. Move H up one square, left one square, and then up two squares. Drag A right two squares and up two squares. Next, move F three squares to the right. Slide J down two spaces and right two spaces. Next, move C down two squares and left one. Now, drag H left one space and down two. Then slide A left one space, up one space, and left two more spaces. Drag J up three spaces and left one space. Move B to the left by one square. Then, drag D two squares to the left. Next, move piece E up by two spaces. Move K right one space. Now, drag F down by two spaces. Slide D down by two squares. Then, slide B down by two squares as well. Now, move J three spaces to the right. Finally, move A three spaces right and two spaces up, into the exit. There you have it. All the puzzles included in Professor Layton and the Unwound Future upon purchase have now been solved and can be set aside until the series continues.